After your veterinarian has examined your cat, he or she may want to begin to collect more information that will lead to a diagnosis and then, a treatment plan. 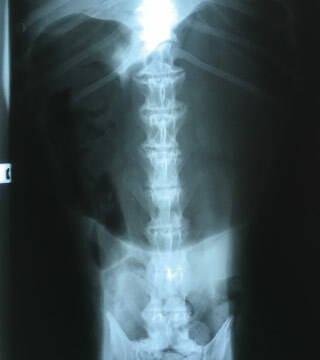 X-rays are usually the first line of imaging. The x-ray may lead to a diagnosis which allows them to move forward with a plan. However, sometimes the next step may be ultrasound to get a more thorough or specific look at a particular area of the body. At Creekside Animal Hospital, we offer X-Rays and Ultrasounds in our hospital. If an MRI or a CT scan is needed for more diagnostic information, we will refer your pet to one of our referral specialty partners. In modern scanning systems like the ones Creekside Animal Hospital has on-site and uses on our feline patients, the sound beam sweeps through the body many times per second. This produces a dynamic, real-time image that changes as the cat ultrasound device moves across a cat's body. We can use the results of an ultrasound to determine what is ailing your cat, and to devise the most effective treatment protocol. A cat MRI is not used as regularly as an x-ray or ultrasound because the equipment is very expensive, very large, and requires specially trained technicians to operate. However, Creekside Animal Hospital offers comprehensive cat MRI services because we believe that facilitating complete feline care means having all the tools and training necessary to do so.